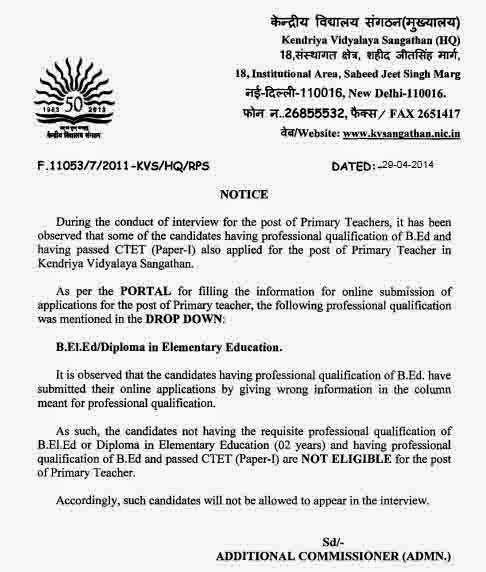 During the conduct of interview for the post of Primary Teachers, it has been observed that some of the candidates having professional qualification of B.Ed and having passed CTET (Paper-I) also applied for the post of Primary Teacher in Kendriya Vidyalaya Sangathan. As per the PORTAL for filling the information for online submission of applications for the post of Primary teacher, the following professional qualification was mentioned in the DROP DOWN: B.El.Ed / Diploma in Elementary Education. It is observed that the candidates having professional qualification of B.ed Have submitted their online applications by giving wrong information in the column meant for professional qualification. As such, the candidates not having the requisite professional qualification of B.El.Ed or Diploma in Elementary Education (02 years) and having professional qualification of B.Ed and passed CTET (Paper-I) are NOT ELIGIBLE for the post of Primary Teacher. Accordingly, such candidates will not be allowed to appear in the interview. NEW DELHI: The Delhi High Court has held that B. Ed. degree holders are also eligible to apply for the post of primary school teachers. Around two lakh B. Ed. degree holders across the country will benefit from the judgment by a Division Bench of the Court, comprising Justice Mukul Mudgal and Justice Aruna Suresh. The order came on a bunch of petitions by a batch of 29 B. Ed. degree holders challenging a judgment by the CAT in 2005 holding that only Junior Basic Teacher diploma holders were eligible for being appointed as primary school teachers in Kendriya Vidyalayas. Counsel for the petitioners Surat Singh submitted that the KVS had in its advertisement in February 2005 invited applications from JBT diploma holders as well as B. Ed. degree holders for recruiting 1,000 primary teachers. Some JBT-trained candidates had moved the CAT against the decision of the Sangathan . The CAT had allowed their petitions holding that B. Ed. degree holders were not eligible to apply. In view of the existing court judgement , how far the latest notification by KVS dated 25/08/2014 is justified in debarring again the PRT B ed candidates for interviews after the main exam they merited in 2012-13 &2013-14 and keeping them in doldrums by shifting the blame on NCTE. B.Ed & CTET 2011 qualified candidates must approach to court with earlier judgement of Delhi High court. As CTET 2011 valid for 7 years.